[OGAds Share] ANIMATED CONTENT LOCKERS! CPA Elites - CPA Marketing Forum CPA Marketing, Help Desk And Experiences Niches, Tutorials & Downloads [OGAds Share] ANIMATED CONTENT LOCKERS! I spent a bit of time fiddling around with the OGAds content locker and I ended up creating a custom one. I'm sure people are well used to seeing these around now and people rarely customize them, so here's your chance to stand out a little bit. 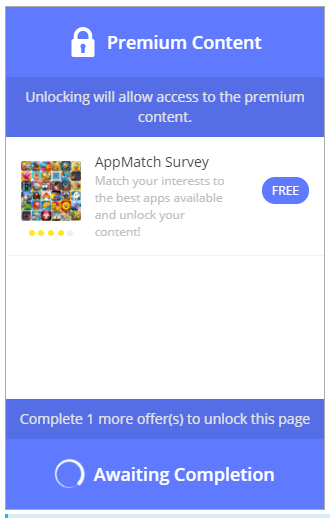 I updated the image, made the description clear and concise, updated the color scheme and animated the "free" button so that it brings more attention to the offers. If you like this theme use the codes below to copy the look, thanks! Put the hex code as your "Main Color" on the locker. If you need a more in-depth tutorial on how to set this up check out this link. Great share mate!! Will Definitely increase cvr . (2018-03-18, 10:38 PM)aruncp Wrote: Great share mate!! Will Definitely increase cvr . There's also a desktop locker I modified too. Perfect locker code, thanks mate. Thank you mate for the locker, it is very cool!